What color do you use for Red Brick? Not having an LHS nearby and the only having 2 shades of red (Tuscan and Oxide). What do you use for your Red Bricked buildings? Pictures would be great too! Re: What color do you use for Red Brick? I think the best answer is "that depends". When examining a real building, what you often find is that the building front is done in a "brick red" brick (or sometimes yellow ocher, tan, brown, etc), that has a consistent pigment mixed into it, while the sides and back of a building are random natural clay colors. For my "Chicago" brick (front of the building), I have been using a "Folk Art" color called "true burgundy" followed by a watered down washes of gray, dark brown, and charcoal gray or black. This seems to me to give me something pretty close to the color of the real thing. Back walls are a mix of shades of tan or brown, with a hint of red. Mortar is also important- the mortar on the face of a building is sometimes (but not necessarily) colored to a hue close to the brick color, while the back will be a "sand" color (literally dependent on the color of locally acquired sand). If part of your building is a newer addition, be gentler with the washes, and vary the base color a little bit. With that said, it is also important to use a variety of colors- look at any block of brick buildings- they may be similar, but don't match- and often one or two use tan or yellow brick, and stand out from the others. So, using a variety of "brick reds" and browns, with occasional variations, will keep your city from looking like it was all built by one builder on the same day. I've primarily used either Delta Ceramcoat Red Iron Oxide as seen here on buildings on the immediate right and left from a pic in my Produce Row LE thread. The building in the right background (I think) mostly used a brown iron oxide - but heavily weathered with powders. The Ford Bldg project from the Challenges thread is using Delta Ceramcoat Burnt Sienna which gives a red look without being too bright. They look great, Peter, and that's a neat scene. Well, don't "color me 'expert'", but when I asked myself the same question, I went to the artists' section of the local Ben Frankin Store and looked at the colored pencils. I made some rubbings and took them outside to compare in daylight to the local bricks. I ended up with "Prismacolor" pencils in "terra cotta", "burnt ochre" and "sienna brown" to match the base color and the dark and light variations, respectively. 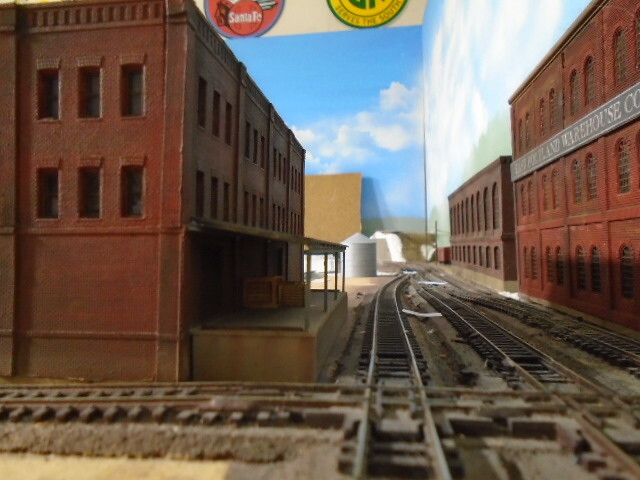 I used daylight to make the match, because I plan to use "daylight" spectrum lighting for my layout. If I had chosen the colors for what I think bricks should look like under the greenish florescent lights in that store, I would have ended-up with some different choices. So, there are some other variables for you to consider. I will color my bricks by rubbing the pencils over the surface after I spray it with the base mortar color, the color of which may also play a role in the finished results. Remember, the person you have to please with the result is yourself. If it looks good to you, that is "right". But, considering how much things like base coat and ambient lighting affect the color perception, I strongly suggest that you make test samples until you think you have what you want, before coloring an actual model. What color haven't I used? I've used everything from Krylon "Ruddy Brown Primer" (I think they changed the name), to various model spray paints, to craft paints. If it's a reddish brown, I've probably used it somewhere. With various overcoats, mortar techniques, weathering, etc, no two of my "brick" buildings look alike, and I doubt that any of them could be duplicated, even by me. Very good suggestion. And colored pencils are also a way to color in some individual bricks even if you paint your brick color with a "big" brush. I too use Krylon Oxide Red Primer. In the past, I used Floquil Boxcar Red. With the Krylon, I go back over with a dry brush of craft paint in a different shade of red. This gives me a desired variation in brick color from building to building. 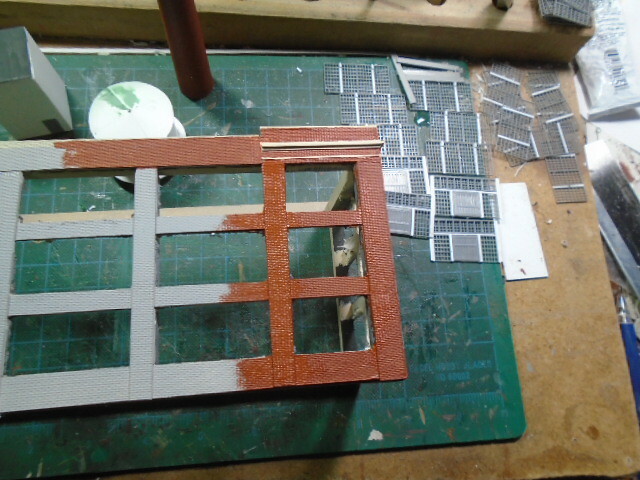 I'll also hit some areas of the brick with dry brushed white, black and browns for weathering and highlighting. Other modelers do a far better job than me, but this method provides a fairly realistic look and gets the job done. For me, any old rattle can oxide red primer will do to provide a base coat, then I'll apply washes to up the ante a bit. On smaller buildings, like DPM, I'll usually prime the building with whatever color I want the windows to be, then I'll brush on craft acrylics to get the brick color I'm after. I guess the short answer is you can use whatever color or type of paint you like, but it's always best if you put a coat of flat primer of some sort on the surface before you go to the color. The oxide red primer sort of kills two birds with one stone.